PRICED REDUCED TO SELL FAST elegant home with a HEATED POOL overlooking a beautiful lake while enjoying breathtaking sunsets. 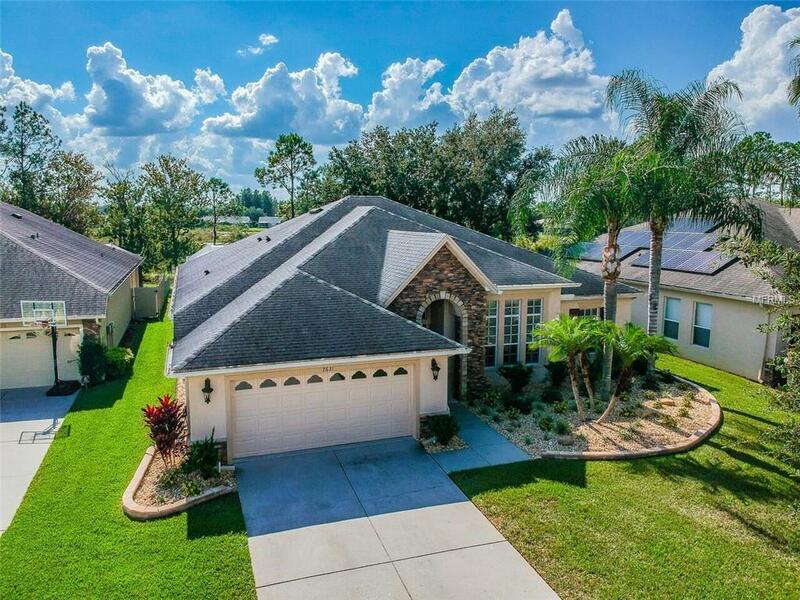 This extraordinary home features 3 BEDROOMS PLUS A BONUS ROOM, 3 full baths, 3 car Tandem garage, spacious living room, & excellent designed floor plan. Fully loaded with upgrades: new swimming pool, crown moldings, walk-in pantry, wired for home security, security lights, surround sound, upgraded kitchen with center island & granite counters, NEW STAINLESS STEEL APPLIANCES, NEW WASHER & DRYER, ceiling fans, professionally designed landscaping for a maintenance free garden, elegant earth tone colors, NEW WATER HEATER, WATER SOFTENER, & WATER PURIFIER, walk-in closets, open floor plan, solid wood cabinetry, window treatments, wooden blinds & huge screened lanai. Pool features include pool sweep, heat absorbent flooring, salt water treatment system, auto cleaner, lighting, sun deck area, waterfall with bubblers to stay cool, finish in the pool is blue pebble to give it a Caribbean deeper blue water color & pool alarm. Another great feature for this home is that it has an extended driveway for plenty of parking. The amenities include Resort Style living such as a lagoon pool, heated lap pool, splash pad, fire pit, BBQ grills, fireplaces, fishing dock, kayaks and canoes, work out areas, saunas, changing rooms, Banquet room, movie theater, nature center, basketball courts, tennis courts, saunas, yoga room, butterfly garden & walking trails. Volleyball Court, Tetherball, playgrounds.